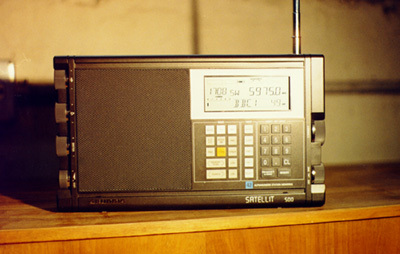 The '500 was introduced in 1989, and was a very good radio mainly due to its sound (of course!) and ease of use. Many radio fans around the world bought '500s during its heyday, and for many it's still their favorite radio. Among other features, the digital display has has two clocks, a signal strength meter, frequency readout, and four-character user-definable "name" for each of the 42 memory locations. The radio decodes SSB and AM modes, and features Grundig's first attempt at synchronous detection. (Simply put, synchronous detection helps the listener pull a station "out of the weeds" by focusing in on the strongest part of the signal.) Unfortunately, this attempt was only mildly successful, but they did it right on the '700. The frequency range is: 150-353 kHz (LW), 528-1611 kHz (MW), 1612-30000 kHz (SW), and 87.5-108 MHz (FM). Grundig's US distributor included a 15-minute videocassette with the '500s that were sold in this country. The narrator walked the viewer through the workings of the radio, and offered a general overview of shortwave radio as well. What a great approach! I posted the video in two parts on YouTube: link to part 1; link to part 2. In this photograph, the '500 is sitting atop my Grundig Majestic SO-111 console. Every once in a while, one of these radios turns up for sale on eBay or in radio swaps. It's worth a serious look if you ever run across one!